Can you find the charge of an electron in a spritz of oil? It seems like the subatomic world is too tiny ever to be meaningfully measured. But that's exactly what two scientists did in 1909. Find out how, with a box, a microsocope, a spritz of oil, and a sensitive voltage meter, people figured out the charge of an electron. Robert Millikan and Harvey Fletcher were two scientists looking for a way to understand a puzzle of their day. The concept of electrons was familiar, and manipulating them through electricity was a growing field. But how to measure the charge of something far too tiny to see? 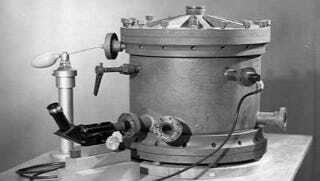 Millikan and Fletcher figured it out, and their experiment was both accurate and ingeniously simple. They built a box out of an insulating material. At the top and the bottom of the box were metal plates. In the sides of the box were holes that let in the barrel of a microscope to observe the proceedings in the box, and to let in the nozzle of an atomizer. Atomizer may sound fancy, but it's just a perfume spray bottle. The bottle was outside the box, and contained a quantity of oil. The scientists applied a charge difference between the plates, one plate being positive and one being negative. Then they sprayed oil into the box. The oil drops had a charge of their own. By rubbing up against the nozzle of the atomizer, they picked up some electrons. Like all things on earth, when they got out into the box, gravity pulled them down. The positive plate, however, pulled them up. Millikan and Fletcher could calculate how much the oil drops weighed, and so they could figure out the force required to keep them frozen in mid-air, hovering. Of course, each drop had an unknown amount of electrons on it, so the entire set-up required repetition. The two scientists made many different sizes of drops hover mid-air. The magnitude of the electric force for each drop varied, but it was always a multiple of a certain value. Since electrons don't split down the middle, that value had to be the charge of a single electron. Millikan and Fletcher calculated the value to be 1.592 x 10^-19 coulomb. Later, with a better understanding of the viscosity of air (which affects how the oil drops move through air), that number was refined to be 1.602 x 10^-19 coulomb. If you want to get a little fancier, you can use x-rays to load up the oil with electrons. Other than that, even a relatively simple set-up can uncover the subatomic world. All it takes is looking at things the right way. Top Image: Wiki Commons. Second Image: Wiki Commons. Via UAF and About.com.